I think I would be safe in saying that the bulk of these tin-foil hat theologians have an independent fundamentalist background, or at least that is where I find them concentrated. I am unaware of any specific Orthodox Prebyterians who are into promoting conspiracy theories on the same level as say, the fellas over at the Jesus-is-Savior website. By the way, why is it that tin-foil hat theologians tend to promote their conspiracy theories with hideous, seizure inducing websites? Are there no Christian conspiracy people who can put together a decent looking website? Why must they all be bright, hi-liter yellow letters on a brown background with baby-blue flashing link titles and crude, rotating graphics?So here we have two, broad brushed generalities concerning tin-foil hat theologians: They are independent fundamentalists and lack the software and HTML abilities to generate pleasant appearing websites. But I digress. All levity aside, however, I am personally grieved when I hear of Christians who have succumbed to being influenced by tin-foil hat theologians and their conspiracies. The reason being is because such theology, if we can even call it that, is extremely detrimental to a Christian’s spiritual health. 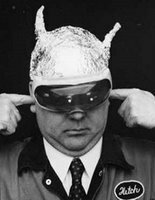 In my first post, I began to point out the reasons why I believe tin-foil hat theology is harmful to a Christian. Let me consider my fourth reason. 4) Conspiracy theories are based upon untenable, fanciful, and irrational scenarios. I believe Christians need to pause and ponder the importance God places upon the minds of his saints. In other words, how we as Christians think about the world is important to our Lord. The Bible describes fallen men as “walking in the futility of their minds” and “having their understanding darkened” (Ephesians 4:17,18); that he cannot know spiritual truth (1 Corinthians 2:14); and that even though sinners know God, they refuse to acknowledge the truth about God and instead dream up fanciful excuses to explain away what they know to be true (Romans 1:18-23). 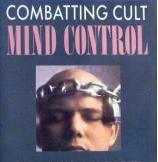 Moreover, the spiritual war waged for the souls of men takes place on the battlefield of the mind. The godly weapons used to engage sinful men are designed to assail the fortress of the mind by pulling down strongholds, casting down arguments and every high thing that exalts itself against the knowledge of God, and taking captive every thought to the obedience of Christ (2 Corinthians 10:4, 5). The imagery of spiritual warfare is connected to how men think: arguments being cast down, having the right knowledge about God, and thoughts captive to Christ. Christians, on the other hand, are described as having their minds freed to think God’s thoughts after Him. The Bible declares, But you have not so learned Christ, if indeed you have heard Him and have been taught by Him, as the truth is in Jesus … and be renewed in the spirit of your mind (Ephesians 4:20-21, 23). The Christian is to be no longer conformed to the way the world thinks, but he is to be transformed by the renewing of his mind and to be sober in his thinking (Romans 12:2,3). Thus, a Christian should never be marked out as thinking irrationally about reality. His mind must reflect the logical mind of God by being reasonable and having a high regard for the truth in all areas of reality. Even with this brief overview, it is clear that God places a vital importance upon how we think. Christians, then, are not free to believe any truth claim as “true” even if the person has really strong feelings about whatever it is he believes. We are to be mindful of what we allow into our heads, because what we dwell upon – think about – can influence how we view reality. In short Christians must discipline themselves for discernment. Now I highlight all of that about the minds of men because a Christian obsessively indulging conspiracy theories does not demonstrate a sober-minded believer whose thinking is being renewed daily. The reason being is because when fully critiqued, conspiracy theories dive into the realm of the utterly fantastic and are built upon illogical premises. A Christian who thinks they are real is a person who is noted by everyone else as being gullible and out-of-touch and does not witness the sobriety of mind that should be common of a believer. – Conspiracy theories are untenable. They are untenable because conspiracy theories are unworkable in real life. Probably the main reason they are unworkable is that the secrecy needed to maintain the conspiracy is next to impossible. There are way too many necessary variables to keep it from being exposed, and probably the most risky one is the human involvement. Humans are prone to general incompetence, as well as greed and other failures of the human condition, and the more people involved with the conspiracy, those human problems are compounded, and thus the greater the risk of exposure by either overall failure or by blabbermouths who are easily paid off to talk or just want to look like a big shot down at the bar. The Watergate scandal, for example, was found out due to human error. The fake CBS-Dan Rather-George Bush Air National Guard memos from October 2004 were exposed as frauds almost the very hour they went on-line at CBS, and again, due to human error. Take for example those who claim the Apollo missions were hoaxed. Hundreds, if not thousands of people were intricately involved with the Apollo program. Engineers, technicians, government officials, civilians, and the astronauts themselves. Additionally, millions of people were eye-witnesses all around the world, including the Soviets with whom we were in a race to get to the moon first. The sheer number of people involved is enough to guarantee the Apollo moon missions were not hoaxed. More importantly, and this point is missed by conspiracy theorists, the Apollo program had a total of five missions to the moon during which men actually walked ont he surface of the moon. That means all of those hundreds of thousands of people had to hoax a moon landing a total of FIVE TIMES! There is no way they could have gotten away with it just once, let alone five times. Conspiracies are just too difficult to keep secret even when there are only one or two people keeping the secret. There are a couple of fun examples of conspiracies being exposed from the Darwinian world. 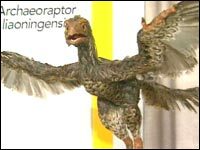 In 2000, Archaeoraptor was purportedly the “evolutionary find of the century,” that proved bird-to-dinosaur evolution. The National Geographic Society claimed it was the true missing link that connected birds to dinosaurs and prominent paleontologists said archaeoraptor was the long sought key to that mystery. Even another example involved archaeologist Professor Reiner Von Zieten who allegedly found remains in a peat bog linking humans to Neanderthals. His career ended in disgrace after the revelation that he systematically falsified the dates on this and numerous other stone-age relics. His deceptions were so serious that it may mean an entire tranche of the history of man’s development will have to be re-written. – Conspiracies are based upon fanciful scenarios. One of the first questions I will ask a tin-foil hat theologian is, “why does he think his conspiracy is needful?” In other words, “Why is there a need for a conspiracy with thus and such?” The reason behind the conspiracy is almost all the time ridiculous and defies all credulity and the explanation of how it was accomplished is almost even more unbelievable. Gail Riplinger, the Queen of King James Onlyism, suggests that modern Bible versions like the NASB or NIV, are designed to corrupt the Christian churches so they will be more willing to embrace the new age and the Antichrist. How exactly does the new age movement and modern translations connect? Ms. Riplinger ties together all sorts of absurd ideas that make no sense and are unsupportable by any known historic fact. I won’t rehash them here, but you can check out a couple of reviews of her claims here and here. Another big conspiracy in the last decade or so that some Christians have advocated involves the terrorist attacks on 9/11. In spite of the fact that the government is nothing but a massive, bloated bureaucracy run by cubicle dwelling hacks who lose my tax returns, many people believe they had the know-how to fake hijacking 4 airliners full of people, set off controlled demolitions to knock down the World Trade Center, while at the same time keeping it all hidden from the millions of eye-witnesses in the general public (except of course for the anointed few with the open minds and dot connecting capabilities). Others suggest that the government used holographic missiles that only looked like 757s. Since when has the government had Star Trek like holographic technology? Am I to conclude that all those terrified passengers who called from the cell-phones were really on some holo-deck in a government facility? Yet tin-hat theologians will continue to buy into those fanciful scenarios because it apparently justify some religious reasoning about the power of one world government or something. – Conspiracies are based upon irrational scenarios. The fanciful ones are bad enough, but even more telling evidence showing how bogus conspiracy theories can be is how the ones with similar themes will contradict each other. For instance, let’s return to the moon hoax. Moon hoax conspirators are convinced that none of the Apollo missions went to the moon and the government is covering it up. Yet, other conspiracy theorists claim the Apollo missions did get men to the moon, but the government is attempting to cover over the fact that the astronauts saw giant building and other alien structures. Now, both of those scenarios cannot be correct. Which one is wrong and which one is right and why? It would be good to remind ourselves of Ockham’s razor, the philosophical principle developed by the philosopher Christian William of Ockham in the 14th century. Simply put Ockham’s razor states: all things being equal, the simplest explanation is probably the correct one. What is the simplest explanation for the moon landing? Was it hoaxed and then systematically covered up? Or did NASA really send up 17 Apollo missions with five of them (excepting #13) landing on the moon? Consider another one from the fevered minds of end-times fanatics. Their literature is filled with warnings for believers to beware of events that are transpiring in the current day world that will allegedly lead to a One World government and the rise of the Antichrist. Yet, I would think, as ones who are fixated on end-times events and the Second Coming of Jesus, they would want a One World government taking place and the Antichrist coming forward. Those are just a handful of examples of how conspiracy theories are detrimental to a Christian’s spirituality. A Christian who gives himself to pursuing conspiracy theories or allowing them to shape his or her view of the world is in danger of putting his mind in subjection to futility. This entry was posted in Tin-foil Hat Theology by fivepointer. Bookmark the permalink. You do have point here, and I agree a Christian should not be consumed by so called false conspiracy theories, but then they say where there is smoke there is also a fire.. Most people are offended when someone underestimates their intelligence or ability. But I think the devil doesn’t mind one bit. ;) I’m sure he’s appreciative! Looking forward to your answers to my questions, Fred, from the May 1st Echo Zoe show, by the way! Where’s Surfer Boy from the 2006 Tin-Foil Hat Theology series? Are you still as supportive of Al Mohler NOW as you were in 2006? Now wait a minute. You said in your first point (about The Truth being “untenable”) that Apollo went to the moon five times. But in your second point about the moon hoax being “irrational” (your fancy ivory tower words don’t scare me! ), you said there were SIX moon landings! Now which is, Misterr Butler? Exactly how many landings happened, according to your Bilderberg masters to whom you serve as butler?!?! Wake up, sheeple!!!!1!!!oen!!! I left following the comments from EZ because they were virtually too difficult to follow being both WP and FB comment formats intertwined. Present your question here, or under the post in which I linked to my EZ interview, and I’ll answer it. Yes. I am still supportive of Al Mohler NOW as I was in 2006. He has never been nor will be a UN agent. Ah. That’s a good catch. I’ll cover that up immediately so that no one will see and suspect anything. Yet, most everything you think you know about geo-politics comes from the media. You have created your reality from the media, not from the Bible and not from God alone. Is the media concerned with the truth? Is the government always truthful? The things you purport to be conspiracy theories deviate from a reality you cannot in the first place prove anyway. As for 9/11, can you honestly watch WTC 7 fall and think, “Ah yes, it was the flying debris and fire that made it collapse in such a way.” Honestly? I find that incredibly naïve, dishonest to self and cowardly. Yes, it is the comfortable thing to believe, but no it is not the plausible thing to believe because buildings don’t fall that way without intelligent help. I’ll mention again as I did above, but pose it as a question: How is the antichrist to ever bring about a one world government and one method to buy and sell without an orchestrated and conspiratorial plan? The major media will be involved because the major media is able to twist God’s laws in the minds of the unredeemed and even confuse and confound some of the elect. Does the media report naturally occurring ungodliness? Or does it promote it, encourage it, and multiply it? Okay, so Bryan, let’s zero in on that building 7 comment. Explain to me why it is necessary to my spiritual growth as a Christian to believe building 7 was blown up instead of falling down due to the WTC building falling on it? How does that make me more Christ-like? More godly? Let me first say that world events, conspiratorially understood or otherwise, are distressing. I would think that a Christian who thinks as you seem to would perhaps have fewer stresses, believing that things occur as they are reported to the masses. I get that. I can see clearly how this would be more conducive to inner peace. In fact Paul tells us, “Finally, brethren, whatsoever things are true, whatsoever things are honest, whatsoever things are just, whatsoever things are pure, whatsoever things are lovely, whatsoever things are of good report; if there be any virtue, and if there be any praise, think on these things.” – Philippians 4:8, KJV. This is a directive and not to be taken lightly by the believer. It supports your argument very well. What of lies then and falsehood? What of injustice? What of corruption? What of hateful things and slander, vice and ridicule? What are we to do when confronted with these things in our personal or business lives or our lives as citizens? Deny they are there? Deny that they are eroding our true, honest, just, pure, lovely, good, virtuous and praiseworthy society and world? We can’t deny it. We have to face it. We can’t pretend those evils are not there and belittle those who see their encroachment. Paul does not deny that evil is cleverly at work or belittle those who are experiencing it, “And every spirit that confesseth not that Jesus Christ is come in the flesh is not of God: and this is that spirit of antichrist, whereof ye have heard that it should come; and even now already is it in the world. Ye are of God, little children, and have overcome them: because greater is he that is in you, than he that is in the world.” – 1 John 4:3-4, KJV. Paul stresses the peace of mind that you are stressing but mixed with the reality of the situation. Keep in mind these people and deceiving demons who, “Confesseth not,” are very actively building a world that is against God by default. It is a world of great misery, therefore. To answer your question, I think that you have it half right and we should not distress ourselves with the events that many of us see patterns to (i.e., conspiracies). However, we should not deny they are there and that they are going to culminate in very difficult times. These times will involve great deception as Paul both comforts us of and reminds us, “Now we beseech you, brethren, by the coming of our Lord Jesus Christ, and by our gathering together unto him, That ye be not soon shaken in mind, or be troubled, neither by spirit, nor by word, nor by letter as from us, as that the day of Christ is at hand. Let no man deceive you by any means: for that day shall not come, except there come a falling away first, and that man of sin be revealed, the son of perdition; Who opposeth and exalteth himself above all that is called God, or that is worshipped; so that he as God sitteth in the temple of God, shewing himself that he is God. To sum up, we need to keep watch as directed. We need to be aware of the time. We are warned not to be deceived, meaning we CAN be deceived, meaning furthermore that Satan is actively trying to deceive us. It makes you more Christ like to heed these warnings, but I agree with you as does Scripture, to not be distressed over events that are unfolding. Note: I believe in a post tribulation rapture/second coming. That may clarify some of my points above. You’ve made me think and have actually given me some peace by challenging me to answer your question. Peace to you in the name of the Lord Jesus Christ. Thank you, Fred. I was anticipating something like this, so I saved my questions after listening, thoroughly, to your interview on Echo Zoe. I have posted my questions on your post about your EZ interview. There are several….I listened very carefully and tried to quote you, as often as possible. Thank you for your kind attention! I think Bryan’s comments and questions have more to do with the issue of the reliability of the media. 1 John 4:3-4, KJV- attributed it to Paul. My error and apology. So, Bryan…you basically rambled, quoted a few loosely related passages, and then completely ignored the one question you were asked. You MUST realize that makes you look mentally unstable, right? 2. Person (b) ignores said question and turns to some other topic that is not obviously related directly but is rather loosely related in the minds of their listeners (very abnormal way of talking). You did #2, in a rather typical fashion. Things like surface quoting the scripture and writing with no paragraphs or overt recognition of the fact that you’re in a conversation make me think you’re not playing with a full deck. It’s important to know how you come across; people who think you are nuts BECAUSE you are acting nutty aren’t going to listen to you for good reason. You’ve proven yourself to be little more than a ‘shock jock’ and you MUST be capable of seeing my point which therefore makes you a dishonest person who cloaks himself as a man of the Word, but in reality is a mocker and ridiculer. Enjoy your just desserts. You will indeed reap the condescension you have sown. And…completely in the dark as to how an ‘Orthodox Presbyterian’ can believe John MacArthur’s stance on the Mark of the Beast. It does appear that you have a serious theological flaw and you are not to be taken seriously. Heretical at least, which qualifies you as worse than ‘nutty’, as you like to say. I’ll be nutty, you be heretical. This has been a pretty awesome – not to mention spot on – article; I can’t wait to read the last two point you have to make! See, this is exactly what I’m talking about Bryan. Neither Fred nor I are Orthodox Presbyterians, so why are you talking about that for some reason? How in the world do you know whether Fred or I agree with MacArthur on the issue of the Mark of the Beast? Why is that even remotely relevant to THIS topic? You’re just fuming mad and blasting out nonsense attacks without thinking. THAT is the kind of stuff that makes you look like the kind of guy who walks around Costco with a paperclip on his ear, pretending to be “on the phone” when you’re really just talking to yourself. I’m trying to help brother. Okay. basically all you’ve said is that I’m stupid. I’m disinterested in discussion with people who apparently don’t know how discussion works. When you have a passage of scripture to go through, let me know and we can go there. Don’t slap me in the face and have the audacity to call me “friend”. I have far more important things to do in my busy day than entertain abuse from a smart alec. On this, I think we can agree, Lyndon. If you don’t think evil is going on in this world and that we are in the end times, and the things recorded in the New Testament isn’t going to be brought about by people, then sir, you don’t believe the Word of God. Are you also saying that Jesus didn’t walk the earth, was crucified, was buried and rose again on the third day? Or was that a conspiracy theory too. It matters not what people say is happening, or who or how, but evil is ramped in this world and we are close to the return of Jesus. Oh, wait, um, or is that just another conspiracy theory. Sir, are you a follower of Jesus? Or are you one of those who get a personal revelation from God? Whether it’s, chem trails, or fake global warnings, evil is going on to deceive people. The one world government and one world religion with the Anti-Christ at the head. Who is my authority? The Word of God. People like you are dangerous to keep people unawares. Jesus said to watch and be aware of the times. He also said not to worry, but He did say to watch. Yes, some of the stuff is ridiculous, but some of it true. But go ahead and make people sleepy about the times in which we live, you will only have to stand before a Holy God and explain yourself. I am very disappointed EB from Do Not Be Surprised even posted the link to this article. I will add you to my prayer list. I’m unclear as to what is going on now. I’m guessing that’s a quote from me somewhere? You might think this is obviously clear, but I’m not really sure what you’re attempting to get at. Do you actually want to tackle the scriptures then or are you providing the words from me (torn from some other interaction on some other location online) as some sort of “here’s the gist of my feelings now please shut up” idea? If you absolutely can’t wait for me to remaster the third article, it is available under my articles tag on the main page under the category of evangelism and apologetics. Lyndon, you’re far too critical and lofty for me to converse with any further. I’m basically a working stiff with a limited amount of editorial time and energy. For me to put together my longer piece above, that you imply makes me look mentally unstable, took just about all of the free time I had that day. I suspect I stumbled upon Fred’s site here in error, as you both seem to be far more advanced than I am. I wish for you the best, if it is the best you wish for Christ’s. Peace to you both. You have totally misread my comment. I am not saying the study of the end-times isn’t important. The issue is a fixation on speculative current day events that end-time obsessives claim represent for certain the fulfillment of some prophecy. For instance, while I see that Israel becoming a nation in 1948 as an intriguing development, I would never insist that it is a sign of some fulfilled prophecy and we can count down from that year a generation (20 or 40) of years and claim the rapture will happen like 40 years from the date or whatever. Much like that Whisnat crank did in 1988 with his book, 88 Reasons the Rapture will happen in 1988. It was a highly speculative (and inaccurate) book that led many people astray, including one of our pastors at my old college church. My point is that speculative end-time obsessions do nothing more than to bind a person unnecessarily to ridiculous notions. That is not spiritually healthy for a Christian, and in my mind, is sinful. Do you not agree? Well, Fred, you’ve read my comment @DNBS and invited me here for your response. Will it be necessary for me to repeat the entire comment? It would be helpful for you to at least post something for folks who don’t necessarily go over to Erin’s blog. Maybe summarize a couple of your key talking points you think refute my ideas here. You teach by insult, Fred. No one has enough sense to know anything unless they agree with Fred. Fred’s word is as important as the Word of God. Yet for all of this you teach LIES and do it in the name of Truth. Your insults are never ending for those who dare question the veracity and logic of one well respected in the “Christian community” of which you claim to be a member. Insult #1: you teach that there are “good conspiracies” such as the Manhattan Project, D-Day, etc. and they required the utmost in secrecy to be carried out. Then you say the “modern day” conspiracies are invalid BECAUSE of the level of secrecy needed to maintain them. Which is it? #2 you lump all those who keep up with current events into the same “tin-foil hat” category and label them as kooks, unstable, (why not psychotic, too?) and believers in fairy tales, WHY?, because Fred Butler sais so? #3 Israel becoming a nation again in 1948, yet to you this was an unimportant “non-event” to you, WHY? Are you so ignorant of prophesy and your ignorance has lead you to conclude that Israel is no big deal? #4 You tell people to think for themselves and when they do they become nut cases THFTs–WHY? #5 Your convoluted logic as found in the next to last paragraph of this article is supposed to swallowed along with the rest of the nonsense found in this post and on this site. Wish for the anti-Christ, really? There is only one entity that wishes for a one world government and the anti-Christ, the anti-Christ himself and you have the gall to tell Christians to do this? WOW!!! #6 And the worst of all is the negative call to Christians given by implication, innuendo, and direct insult to cease to watch for the return of the Lord Jesus. You have instructed your followers to ignore the call to watch and pray, put them in the same boat as the five foolish virgins, and counted the words of the Lord Jesus as not necessary, insignificant, wasted breathe. Yet He tells that when we see certain signs we are to lift up our hear for our redemption draws near. But you, Fred, tell people they are “unstable” for paying attention to current events by lumping all such events in with what call “bad” conspiracy theories. #7 You, by doing all of the above have called the Lord Jesus Christ a liar. Are you one of those neo-reformed, a-mill, dominionist, kingdom now kinda guys? Is there a Rapture in the future of the Church or not? Bottom line here is “believe Fred” only-ism. Don’t think for yourself, don’t dispute the bad teaching found on this site, believe the Bible as Fred interprets it for you and you will be welcomed into his fold. And which fold is that, Fred? First , I reread my comment and I must ask you to forgive my horrible words. I repent of it and I am so horrified at myself for such behavior. I could have written it better and as a sister in Christ, and in a manner of sisterly love. I did not and I must ask your forgiveness. There is no reason why I should have been so harsh. Please forgive me. I agree with you on most points, but do you agree that most stupid and misleading rhetoric usually comes to light when it doesn’t happen? I just worry that people would take some of what you said and then just turn away from the times and miss what they are supposed to be watching and praying for. Your article seemed like it is all or nothing and that concerns me. To say there is no balance when it comes to teaching the whole Word of God is an understatement. What has happened to expository teaching. Gospel, Prophecy, Sin, Christian Life as described in the Word of God. It wasn’t until two years ago that I learned that Jesus is in the Old Testament. There are a lot of weird things being said out there by almost everyone, and I personally stick close to God and His Word for fear that I will succumb to belief in this stuff like my sister. I also thing some of the crazy stuff is an intention of satan to deceive and distract from the real fulfillment of prophecy. Like the falling away of the church. Chris Roseborough from Fighting For the Faith brings to light the serious apostate teachings and the silly. Because the silly can be just as dangerous even if it makes us laugh. The fact that Israel has come back into their land is fulfilled prophecy. But is no way an actual time line of the end times. The early church believed they were in the end times too, and I am not a scholar, but can see that we have been in the end times since Jesus ascended back to heaven. Please do not dismiss all “theories”. Test them. From the most obscure people we can have things awakened to us. The Holy Spirit will be our guide. My sister told me about Chem Trails which the warning bell ringer is a man whose first name escapes me but I do know his last name, Murphy. Just google Geo-engineering and Murphy and it will come up in the results. Watch his videos. There is also a woman whose name also escapes me at the moment, who is a former Air Force personnel. See her video and read her articles. It will be eye opening. I do not believe either are saved, but God uses all people for His Will. I pray they get saved. I believe the “geo-engineering” is going to be used to present a “crisis” that will contribute to bringing about the new world order. Christians, I have heard and read are being blamed for “global warming” because we do not believe in Evolution. Part of that “geo-engineering is poisoning us too with metals being put into the air. Edward Snowden even publicized documents to the fact. It is reported he said although he agrees with the need for it, he does not like that it is putting these metals into the air for us to breath and into the water and soil. You can go to a few sources, like the United Nations to see some of the the items on their agenda.and you will see what is happening. Paul wrote that there would be “evil inventions” so we need not be surprised, but we need to know. Now we need to know, but we are NOT to do anything but pray. Not form a protest, or vote someone into office or some violent uprising, or complain to the government; we are to pray. We are to live in this world, not be of it, and protests and voting and other manners of unrest are activities of the world. Why is it that brothers and sisters in other countries don’t get to protest, but we feel it is our right to do so? We do not have to agree with authority, but we are to live rightly under authority as the Word instructs and if it conflicts with the Will of God. It is then and only then we continue to peaceably decline. Which will bring about persecution, but so be it. Where in Scripture does God say we have rights of any kind? We have the righteousness of another, non of our own. We deserve death for our sins, but were saved by Jesus’ death, burial and resurrection for the remission of sins. Where is our so called rights? There are non and we should expect as followers of Jesus Christ to have tribulation and persecution. And, to count it a blessing, be joyful in it. Evil is coming in a way we here in America have not tasted. We need to know what is coming. Do not dismiss everything, but test it. Fred, it is a matter of urgency as people die everyday in the thousands if not tens of thousands not being regenerated. One is because they dismissed something that God used, even if it was crazy or unreasonable, that could have brought them to the Gospel. The fear of God is a good thing even if prompted by a scare tactic. Please, please do not dismiss everything in your writings. Some will mock me, okay have at it. But as the Holy Spirit awakens me from sleep to the Word of God, I can easily see that the Word of God is alive and being done right before our eyes if we only read His Word and see. Have ears to hear and eyes to see. The new “thing”, if you will, that is becoming main stream is the Word of God is “spiritual”. That the Revelation of Jesus Christ is symbolic and spiritual only. This is being said by those claiming to be followers of Jesus Christ! Well, if what they believe is true about Revelation, then Jesus didn’t actually hang on a cross and he didn’t really bear all the sins of the world, and it is just a story to make us feel better because it is good news. NO! I believe in the literal death, burial and resurrection of Jesus Christ! But His death was brought about my the hands of man (men). Someone actually went and brought back people to take Him to be killed (crucified). Some person had to do that. It is real, it was a conspiracy, it is fact and truth! Mass murder occurred at the hands of Herod to try and stop the savior from being born, but he was too late! History records Romans watching as Christians died because they would not pledge allegiance to Caesar or serve in the Roman army. (They were deemed unpatriotic, Hint, hint). I could go on but I hope you understand what I mean. I pray that you do. I have been to so many Christian Blogs, websites, Facebook, Twitter, etc my hands are numb from typing on the keyboard. ALL, all have some error of some sort. We all have error of some sort. But the worst is those who discount prophecy as a conspiracy theory as a rule, and those who are “patriotic”. (not saying you are) And the funny thing is, they think that idolatry is fine because it doesn’t look like idolatry. Sorry to be long winded, but I need to say what I did as a whole. I am sure I will be misunderstood, blasted, and all other manners of rebuke, but just go to the Word and measure. That is all. If it comes across as mean, please forgive me it is not intended to be so, I am just passionate about the Faith and sometimes my disappointment looks like anger, but it is not, it is sadness. I have to confess, my prior post was just plain mean and I am truly sorry for it. The Manhattan Project is ecumenical and best shied away from. Don’t need to sign a document to tell others that you will uphold the tenants of God. Besides, which God does this document represent if all religious leaders sign it? Also, I read some of your response to others Fred, and I think you were being mean. See my first post as an example of how not to say something. Reason together without name calling please. The world is watching us. Peter and Paul disagreed but they were respectful and brotherly. Please the Lord is watching too. You teach by insult, Fred. No one has enough sense to know anything unless they agree with Fred. I can’t possibly understand how you got such an attitude with anything that I wrote. I take it that you have only read this one post? I have 9 years of blogging behind me. Making that conclusion based upon this one post or is this something you witness throughout my entire body of work? Yet for all of this you teach LIES and do it in the name of Truth. Claiming I “teach LIES” is a rather serious accusation. It brings into question my salvation, because no Christian is of a lie. So apparently, from this one post, you conclude that I am a deceiver who is intentionally leading astray my readers for some dark, nefarious purpose. Of course, somehow I have managed to fool all the Christian people I work with day in and day out and who have known my character for decades. I even managed to fool my sweet wife and my kids. And folks wonder why I am even addressing the impact of conspiratorial thinking has on people’s emotions and ability to discern. Now we get down to brass tacks. For the sake of brevity, I will only supply my response to each of your points. #1) First off, I don’t see how any thing I have written is an insult let alone what you mention here, but oh well. Let me highlight some problems with your complaint. I used the examples of the Manhattan Project and D-Day to demonstrate that conspiracies exist. Further more, they are not “bad” conspiracies. They had a purpose, national security. Many similar “conspiracies” exist today. However, the major problem with your objection here is that all of those conspiracies eventually came to light. There were scores of people involved, they couldn’t keep secrets on that level secret forever. If there are bad conspiracies happening on the level of the Manhattan Project and D-Day, so many human beings are involved they cannot possibly keep those conspiracies. That is why the idea of our government pulling off 9/11 and blaming it on Muslim terrorists is absurd. Also for those who claim the moon landings are fake. #2) I am not sure what you mean with your second “insult.” What current events do you have in mind? You’re over reacting to something here. #3) I didn’t say Israel becoming a nation is necessarily an unimportant event. You are reading way into my comments by asserting that I am a moron because I don’t believe it is a “big deal” like you think I should believe it is a big deal. I specifically stated that it is inappropriate to begin date setting and claim that there is some immediate fulfilled prophecy happening. If Muslims push Israel into the sea and they are no longer a state, what will that mean about 1948? Still, I believe Israel will be restored in their land. #4) If people are thinking poorly and sub-biblically and dishonoring God and stirring up strife in their local church and remain stagnant in their spiritual walk with Christ due to conspiracy theories, that is a bad thing, do you not believe? #5) Do you not understand the disconnect between those who continually point to specific current event signs and make such a big deal about end-times events that that is the only thing that consumes their time and energy to where they are no spiritual good, while at the same time they should be yearning for those events to hasten so that Christ can come back? You really don’t see that disconnect at all? When the AntiChrist arises, then Christ is coming even sooner. Are you of the opinion that we shouldn’t look for those times and welcome them with joy because we know we will be with our soon coming Savior? #6) On the contrary, I haven’t told my readers to stop watching and praying for the Return of Christ, but to do so without the constraint of conspiracy theories about end-time events and do so sober-mindedly and to be biblically informed. Not speculative current events informed. #7) You should seriously repent for your slander in saying I am calling Jesus Christ a liar. Shame. No worries about the first horrible and terrible post. In relation to your first comment above, you kind of gave me a ton of stuff to respond to that I honestly can’t. Reading your comment, we are probably more agreed on things than what was originally considered. I would merely exhort you to re-read what I wrote with this post and the previous one that introduced my series to get the gist of what I am saying. As for the chemtrail stuff, I’d encourage you to read this essay by Bill Whittle, who , like the individuals you referenced, isn’t a believer either, but makes some excellent observations about the myth of chemtrails. http://www.ejectejecteject.com/archives/000140.html Men don’t need to be poisoned to stand against God. As for the Manhattan Project you mention, I think you meant the Manhattan Declaration, which was an ecumenical document. The Manhattan Project was the development of the atom bomb during WW2. Interesting that your claim to be a “Christian” is based on the testimony of your family and co-workers. Just wonder what the Lord Jesus has to say on this matter (Matt.7:21-23). You teach by insult, you respond by insult to all who disagree with you, you evade direct questions (except for the last one, but was that really an answer or just another dodge? and no I’m not going to read your “studies in eschatology” for how would that make me more Christ-like?). Both of these TFHT posts are designed to put the mind into neutral, believe all the lies of a government who cannot lie (and here I thought that it was only God Who cannot lie) and become good little robots fit for their master’s use (the one world government that you would have us believe is nothing more than some bad conspiracy). Would you have Christians believe lies, on any level, Fred? Your posts are geared to just that. Case in point is 9/11. You totally blew off Bryan’s question about building 7 and insisted that we believe, swallow and accept the government lie about why it fell (you would have us believe a lie). The big lie about the towers is that heat transference from the jet fuel traveled some 80 floors down to the foundation and that caused their collapse. If the heat was that intense why did not each building tilt over from the point of impact first and topple in an uncontrolled manner? Also, where did all the debris go? Two 110 story buildings fall in a manner consistent only with a controlled demolition (and a great job the demo team did, most such demos have a little side tilt to them, even if unintended) and the resulting debris pile comes up short for the material mass of the buildings. Why is that? But you would have people believe the 9/11 commission report like good little subjects of a government that cannot lie instead of question their findings because to do so would place them in your all inclusive TFHT conspiracy nut job category and we can’t have that, can we Fred? What’s this got to do with a godly Christian life? In itself little to nothing, but when you, Fred Butler teach people to believe lies, that it is wrong to investigate and ask hard questions, and that if you do so you are not a godly person walking with God, and therefore are to be labeled a nut job, ignorant of spiritual concerns (which is the end game of both of these TFHT posts), you’ve crossed the line. It also teaches that a pew sitter is to believe all that falls from the mouth of the one in the pulpit, that being a good Berean is not just unnecessary, but wrong. Is it really necessary for you to control your disciples by insults, humiliation and badgering them into compliance with your implied accusations of stupidity and ignorance? Yet you would have us bow to the lies, and believe that there are no conspiracies carried out by our own government (enter Mark Snowden). To have such a mind set produces blindness to the heresy going on under your nose every day because to question is the new taboo. And that, sir, is the goal of every false teacher-blindness. If you knew that a certain “pastor” held in high regard with many years of “service” was found to be teaching lies and heresy would you expose him or sweep his deeds under the rug? What if that “pastor’s testimony” was based an attaining of salvation due to his heredity, his lack of sin in his young years excusing him from any need of repentance? Would you follow or expose? What if that same “pastor” taught that the blood of Jesus Christ was nothing more than a euphemism for His death, follow or expose? That Jesus Christ became the Son of God when He was born of Mary and was not the eternal Son of God, would you follow such a man or expose him? There is more of this man who is still teaching his lies today, but the point is that we must question and not simply accept because of the source, which is where your ideas in these two THFT posts take us. Was is your intent to do this? I hope not, but it is the result. Alright Darrel, thanks for playing. You are the embodiment of why I believe these posts are important. I’ll let other readers determine the legitimacy of your comments. It was nice to play in your sand box, I found your favorite spot where you bury your head, but it was occupied with your head. I’ll not likely be back to subject myself to your attack dogs. Next up will be the shaking of the dust off my feet. Good-bye, Fred Butler. Thanks for the correction, I did mix the two, yes I was referring to the Manhattan Declaration. The WW2 Manhattan Project was a conspiracy? Didn’t know that, never heard that. Don’t want to know either. I’m out. Peace. Is that from Isaiah? What chapter is that? That’s just it! By ignoring evil and injustice deluded individuals align themselves with evil and injustice. Making one self god-like? Wasn’t that the serpent’s deal?